My latest listing finally hit the market! Imagine owning a charming studio overlooking a serene garden oasis. 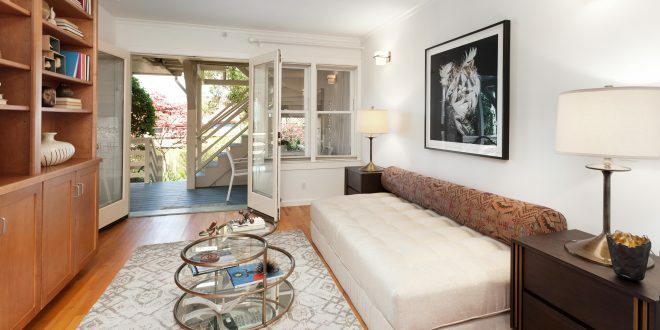 In the midst of much-desired bucolic Presidio Heights, this condo is perfect for a first-time buyer, as a pied-à-terre or for someone looking for a welcoming extra space for visiting guests. The unit has a modern kitchen with granite counter tops, stainless steel appliances and an eating area with a view of the garden. Beautifully designed attractive wood cabinetry separates the kitchen from the living area. An updated spacious tiled bath with a bathtub/shower combination completes the unit. In addition there are double paned windows, recessed lighting and hardwood floors. French doors open onto a shared deck and lush garden. This condo is in a small three-unit Victorian. Step out the door and walk to fine restaurants like Sociale and Spruce, a variety of popular shops, and nearby public transportation. This condo has open houses Saturday and Sunday, April 14 and 15 from 2-4 and open houses Saturday and Sunday, April 21 and 22 from 2-4. Stop by and see this private getaway! For more information go to 333bcherrystreet.com! Previous: The Latest on Sales in Bucolic Presidio Heights! Next: Pay Attention to those Title Reports When Buying (or Selling) a Property! !